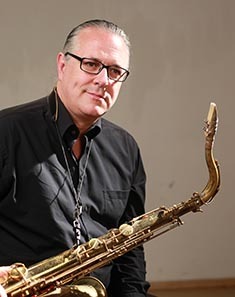 Doug Webb continues to be the go-to saxophonist on the Los Angeles film and television scene with over 30 years in the business, and over 500 recordings. In the last decade, Webb has also been focusing on his own work as a bandleader and jazz musician, releasing several critically acclaimed records. His latest project is titled Fast Friends (Posi-Tone, 2018), and has Webb playing with some of L.A.’s best musicians (Mitchel Forman on piano, Chris Colangelo on bass, and the legendary Roy McCurdy on drums), and the accomplished trombonist, label mate and fast friend, Michael Dease. Fast Friends is Webb’s ninth Posi-Tone release and follows these star-studded leader albums; Bright Side (2016), Back East (2015), Triple Play (2015), Another Scene (2013), Swing Shift (2011), Last Trane To Georgia (2011), Renovations (2010), and Midnight (2010). Webb grew up in California, where he began playing the clarinet at the age of eight and added saxophone and flute at fifteen. After receiving a Bachelor of Music from Berklee College of Music in Boston, Webb moved back to Southern California, and since then has been an in-demand saxophonist for television, film, and music. Over his career Webb has played and recorded with such notable talents as Horace Silver, Freddie Hubbard, Horace Tapscott, Billy Higgins Sal Marquez, Stanley Clarke, Quincy Jones, Mat Marucci, Kyle Eastwood, Billy Childs, Rod Stewart, Carly Simon, Art Davis, Kenny Rogers, Bonnie Raitt, and Pancho Sanchez, and has been featured on over 150 jazz recordings. He was a member of Doc Severinsen’s big band for 15 years. He has recorded music for hundreds of movies and television programs, including Family Guy and Law And Order (sax solo on the title theme). Webb’s solos can be heard on the soundtracks of many films, including Mystic River, Million Dollar Baby, Jersey Boys, and Gran Torino.